The following code is my reshape() function. When I have application window maximized (4K) I get results around 2255 x 1370 which are totally wrong, because 4K is 3840 x 2160, so an output 3600+ x 1900+ will be ok.
Is this a bug, or I miss something? 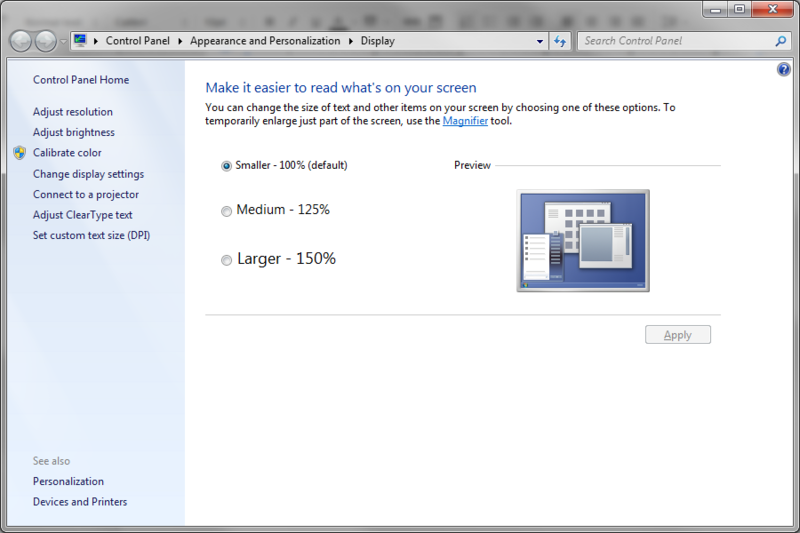 I had change text size (in Control Panel) from smaller (100%) to larger (150%). 2255 * 150% = 3382 which has pretty logic. I change text size to smaller (100%) and reshape() works ok. I use a canvas in swing. If that's the way you'd like to communicate with us, don't expect any help. The control dialog you refer to makes "text and other items" larger by changing the DPI. Windows makes "text and other items" larger by giving applications a smaller window and then streaching the window to match the new DPI. It is a Windows feature. It was the elation of "I found a bug!". It is not a bug, it is a Microsoft windows feature to scale everything to look 150% bigger by lower the DPI and sacrificing detail. It is a windows feature. But when I render the scene, it takes only a part of drawable. Because implied glViewport() called with wrong parameters. Getters return the scaled dimensions. Rendering happens in real dimensions. I have my doubts that you are wrong. I am not so sure by the way. I believe there is no detail sacrifice. Certainly some gui bitmaps upscaled without more detail. But fonts rendered bigger and they are vector graphics. The point is that in my 4K monitor I must have 150% upscaling. With 150% upscaling, JOGL getters return smaller surface dimensions but rendering happens in physical dimensions, and there is no conversion between them. This article describe how microsoft thinks developers should deal with DPI awareness on windows. There is no silver bullet. most of the DPI aware API's are not available on all windows versions. How windows handle DPI cause unexpected user experience for many opengl frameworks. what really complicate it is that different opengl drivers (nvidia and intel) has bugs that only appear when trying to use the DPI aware api's. example images on how one opengl application can behave differently depending on the opengl driver in combination wih DPi settings. A: all windows versions. a fix need to work for both when DPI aware APIs are available and when DPI aware apis are missing all depending on the windows version. thus if you want to help fix DPI on windows you can work on extending a junit testcase that break with your driver and windows version.